Tortilla Pinwheel Recipes are lip-smacking good and very easy to make. Pick your favorite cream cheese flavor, a meat preference, and tasty extras. You just roll the delicious filling in the flour tortilla along with cream cheese. Then tightly wrap the log in plastic wrap, refrigerate to set it. Before the party gets into full swing, slice and serve into bite-size spirals. The minute you set them out you’ll have your guests running to the snack table to grab the appetizer roll-ups. This recipe is updated from the original December 2017 version. Last updated November 2018. 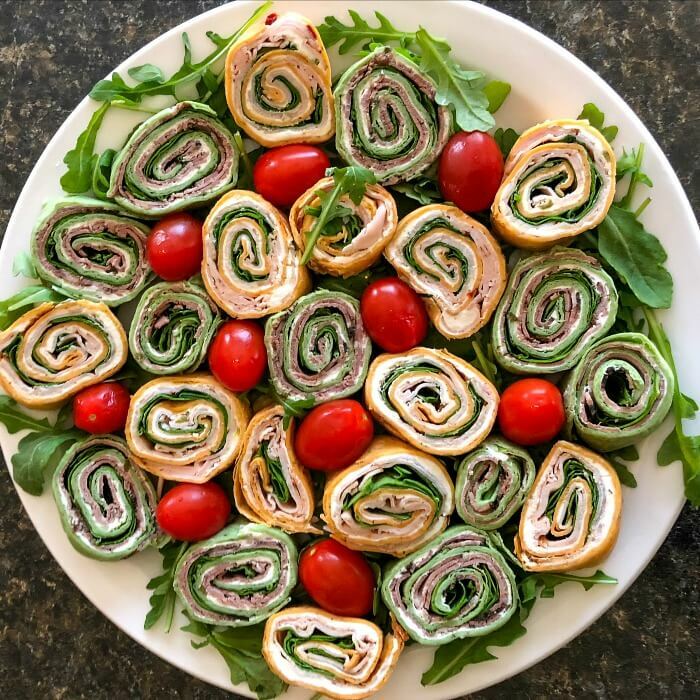 Ingredients you need for Tortilla Pinwheel Recipes: tortilla wraps — as many as you want, thin- sliced meat — whatever kind you like, cream cheese in any flavor that compliments the meat, baby spinach, arugula, or any veggie you prefer. I think everyone loves appetizers! Little bites you can pop in your mouth and enjoy. That’s the beauty of pinwheels. They’re small but they pack a mighty flavored punch. Recipes for tortilla pinwheel are endless. Not only can you buy flavored tortillas but also flavored cream cheese and any meat you like. There are countless deli meats. 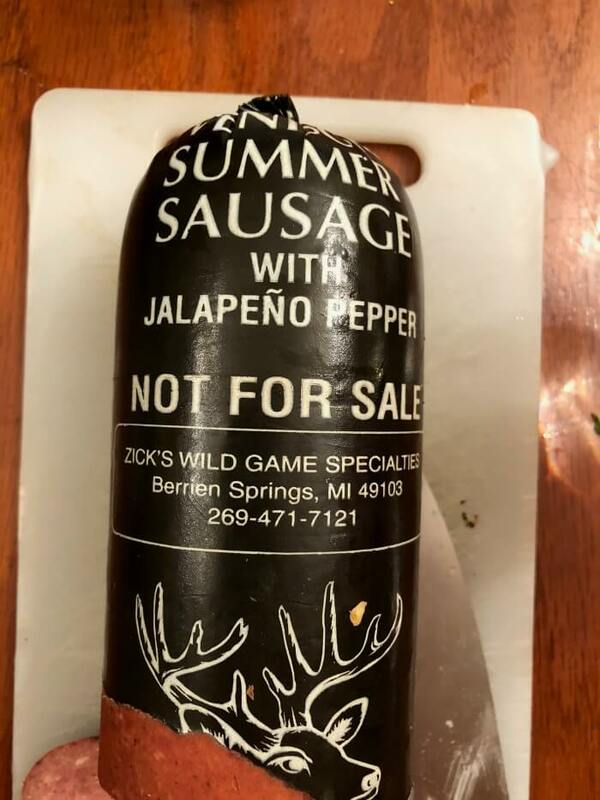 We even used a spicy venison jalapeño pepper summer sausage variation. That was compliments of our son, Jason. Can I eat cream cheese pinwheels if I’m watching my weight? You want it low-calorie? Easy! Use Neufchâtel in place of cream cheese, it’s lower in fat, and you can use low-calorie meats. You say you don’t want meat? Feel free to use your favorite veggies with something creamy and tasty inside. I remember the first time I saw the recipe for a pinwheel appetizer. It was in one of those little Pillsbury cookbooks that came out every month. I thought anything that easy can’t be that good! We had a Christmas family gathering coming up and I thought, hmmmmm, a perfect time to try the wrap recipe. I mean, after all, if you can’t experiment with your own family then who can you try it on? The first time around we used plain flour tortillas for the appetizer roll-ups. I don’t think they even had flavored tortillas that many years ago. Our experience with flour tortillas was to make luncheon wraps. I decided to be daring. 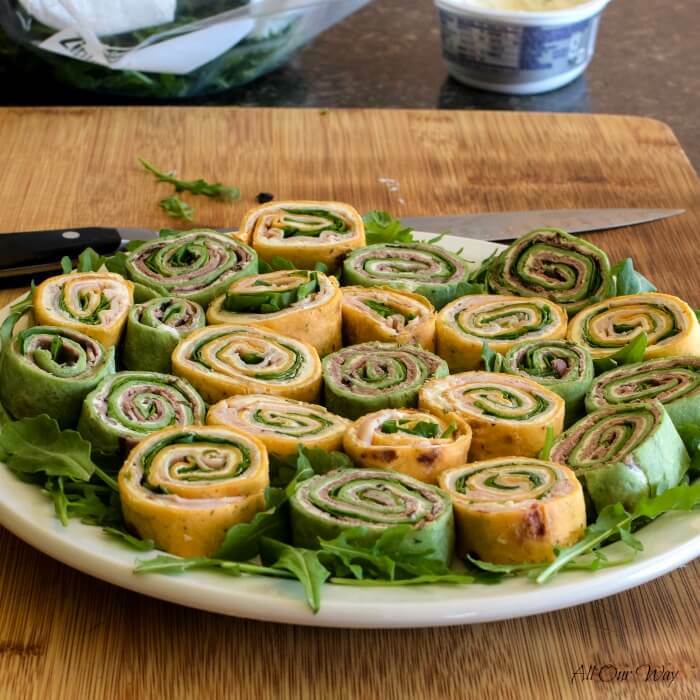 One of the tortilla pinwheel recipes I decided to make was smoked salmon wraps with smoked salmon cream cheese and arugula. That idea wasn’t in the little cook booklet and seafood wasn’t popular in the family. But it was a HUGE success. Even the non-fish lovers gobbled down the miniature sandwiches. Fresh flour tortilla wraps plain or flavored. Important that they are fresh because they are more pliable. Thinly sliced meat – we used a variety of delicatessen meat, except for the venison summer sausage that we cut ourselves. Finely cut meat will roll up easier. Flavored cream cheese – you find this in the dairy section of a grocery store. You can flavor it yourself but this made it easier for us. Lettuce greens to compliment the meat and cheese – this adds flavor and moisture to the appetizers. Don’t go too heavy– they won’t roll tight. Taco – taco meat, salsa, cheddar cheese, onion, cream cheese. Turkey – diced turkey, dill pickles, olives, cream cheese. Veggie Bacon Ranch – ranch dressing, green chiles, bacon, cream cheese. Smoked Salmon – smoked salmon, arugula, smoked salmon cream cheese. Reuben – corned beef, chopped sauerkraut, onion, Thousand Island dressing, cream cheese. Southwest chicken – chicken, Ro-Tel tomatoes, cheddar cheese, cream cheese, olives. Italian Pizza – salami, pepperoni, hot peppers, parmesan, cream cheese. Can you believe all the amazing variations? 🤩 I would want to try each one of them. I am a Reuben sandwich fan and I don’t usually order it at a restaurant — it’s pretty high in calories. But the pinwheel appetizer sounds like just the thing. The Italian pizza pinwheel 🍕 sounds very tasty too. Which one would you pick?? Everyone loves munchy foods and these little appetizers are no exception. Un caro saluta e alla prossima. These wonderful appetizers and some drinks and you have a party. FOR THE RECIPE YOU MAY NEED . . . The following are affiliate links. We are a participant in the Amazon Services LLC Associates Program, an affiliate advertising program designed to provide a means for us to earn fees by linking to amzon.com and affiliate sites. Grazie for being a part of All Our Way! The combinations of these delicious cream cheese roll ups are endless. Just picture the deli section of your grocery store and the meat selection behind the glass. You can just go wild with your picks. And cream cheese is like a blank canvas. Get creative with your tortilla wrap combinations. You can’t go wrong. These mini-sandwiches are easy to make and popular with everyone. Love this recipe? Please put in a 5 star rating. A quick and easy roll-up appetizer recipe that uses deli meats, and flavored cream cheese with a green of your choice. Use flavored wraps to make the tortilla appetizer more colorful. The variations are limitless. Let the flavored cream cheese come to room temperature. Spread the cream cheese evenly over one tortilla wrap. Place slices of one of the meats over the cream cheese. Leave some room at the end so that you can roll up the meat and have it stick. Sprinkle the greens over the meat. Starting at one end, tightly roll up the meat to form a log. Put the log on a piece of plastic wrap and roll it up. Put it in the fridge to set. Do the same with each tortilla wrap and select the flavored cheese to match your meat. When ready to serve, unwrap the roll and slice in the thickness you prefer. Note: Recipes and content from © 2014 – 2017 All Our Way are copyright protected. Please do not use content or recipe without prior written permission. If you want to share the information please link to this post. Grazie! These are so great, love that they can be made in advance. There is nothing worse than having a bunch of people over for a party and having to spend time in the kitchen getting the apps ready. Ooh.. I want to try the smoked salmon variety. But, I know that my husband will want to Reuben version . I guess I’ll have to make both!! Thanks for the ideas! These are the best make ahead apps! Also, they’re perfect for meal prepping too for lunch! They’re so cute and also so portable! I need to visit your place for these snacks – the flavour sounds delightful. Such a delicious tortilla pinwheel sandwich! I am the type to go for appetizer style food always! These pinwheels are easy to make and have to be a hit at any party or perfect light lunch or dinner. Pinwheels are so easy that I never think to make them when having a party. That needs to change! Your Southwest Chicken flavor sounds delicious. I just love how versatile these are, and the wonderful suggestions you give. These are adorable and the perfect app to bring to a party. I’m imagining bright green pesto and sun dried tomato spread for a fun holiday idea. Thanks for the inspiration. It’s so true! Whenever I see these I make a point to hit up the appetizer table. I don’t know if it’s because of the cream cheese that I know that in them or the colorful variations but it always catches my eye. They are also easy to eat without the fear of the food landing on my shirt. Love these! Every time I make tortilla pinwheels, I make them too small. I think that’s where I’m going wrong. Yours look nice and full…and I wish I had some in front of me. I love the variations you included too! Can’t wait to give these another go 🙂 Just pinned! I was just in Colorado where I tried Elk bratwurst — and I think it’s such a genius idea to make sausages and such with game meat. Healthier and really delicious. 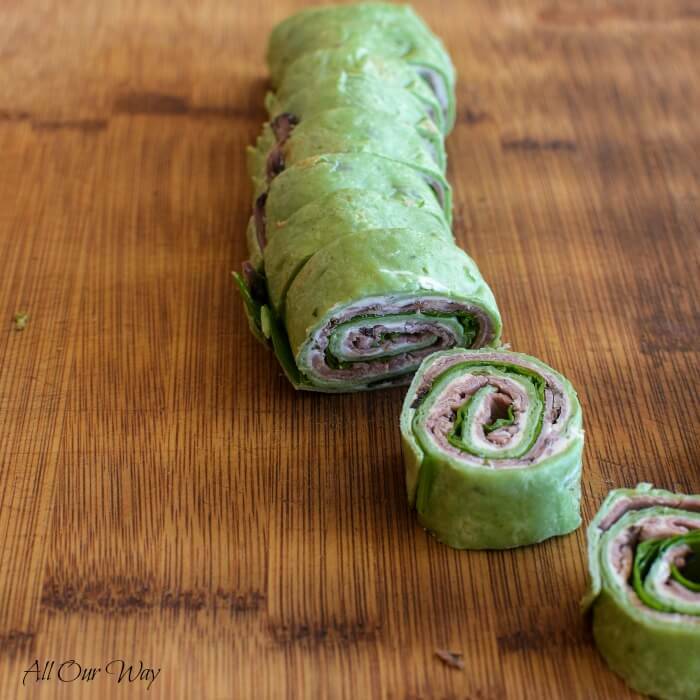 Would love to try the venison summer sausage in these tasty pinwheels. — You’re so right… how can you go wrong with little bite-sized nuggets of goodness? Beautiful Snack! Its fantastic! YUM! This looks so delicious! That looks so warm and comforting! I can’t WAIT to try this! Thank you for this great recipe! Marisa these would be perfect for an evening get together. My kids love tortilla wraps and I make them often. I bet they will love this cream cheese version too. Sounds so yum. Not just it’s easy to make, i’m sure it tastes out of the world! I love how gorgeous you have platted. Irresistible is the word! It’s been so long since I’ve had pinwheels! I’m going to be looking for that jalapeno turkey and I know my fiance will love the venison version! I love how super easy these are to make. So many delicious variations too. With party season just around the corner, these are perfect party appetizers to whip up in a flash. Great for taking along to potlucks too. They look pretty and sound tasty too. I’m going to have to give it a try. Thanks for sharing on #BloggingGrandmothersLinkParty. I’ll share on social media. This looks like a wonderful treat for many occasions so I’m pinning it for future reference. Thaks! Hi, Dee! Thank you for stopping by! Yes, I did make them on Facebook live. Have a Happy Labor Day!! I love this idea for the Holiday. They are so pretty and we always need something to snack on while the calamari is frying! Ah, calamari! that was my papa’s favorite! When we first came to this country all of their favorite meats were nowhere to be found. Eventually, friends who moved to Chicago would come and visit us bringing them lots of Italian goodies. Congrats! Your post is FEATURED at the #BloggingGrandmothersLinkParty ♥ Party opens in a few hours! How do you stop the wheels uncurling once people start taking a few? Hi, Maggie! 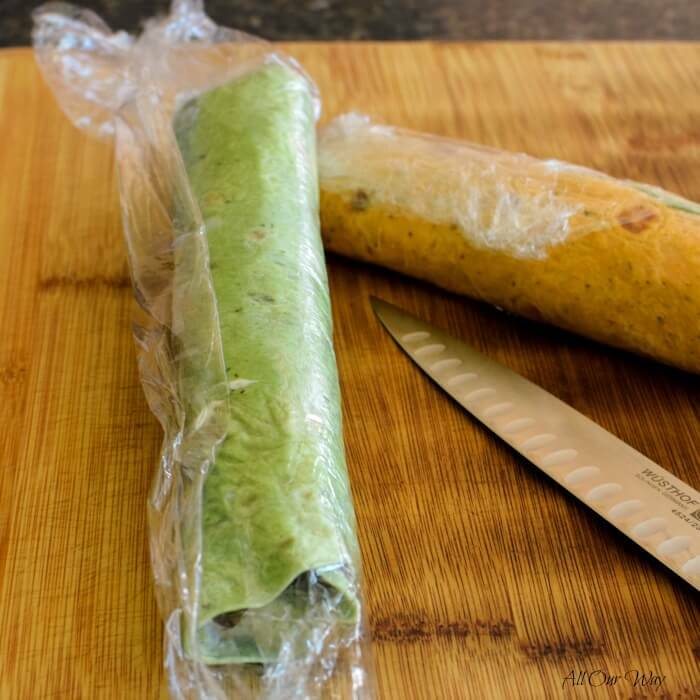 You roll up the tortilla and wrap it in plastic wrap. Let it rest in the refrigerator. Once you cut them they should stay together. What we do is make sure along the closing edge of the tortilla there is cream cheese to help hold it. Now, you can also add a toothpick. We’ve never had any problems. Our family loves them!! How much is considered a serving? Hi, Diane! I would say 3 pinwheels. It’s an appetizer so you could even go one more. Hi, Amy! A day in advance is good and even two days — they’d still taste good the third day but the tortilla wraps would be a little moist. It doesn’t affect the taste — just the texture. Ideally would be a day ahead. I just got extremely happy to come across this post. I’m making something similar to this for my husband’s dinner party this weekend. Love it! Pinning! Hi, Mirlene! Well, I’m glad you found it too! I know it’ll be popular. We never have any left. A dinner party! How exciting! Have fun– xoxo. Costco used to carry a WAY more utilitarian version of this recipe. It was one of my husband’s favorite ‘snacks’ to buy. (Yes. He eats a lot!) Literoly, on our Costco run today he brought up how much he misses them. Can’t wait to make a batch of these as a surprise!! Hi, Mikaela! We’ve bought them before at Costco and we took them to our kids and grandkids to snack on. Really, the homemade are better because you can fine tune the ingredients to just Hubby likes them. Have a great day — stay warm. Love at first bite is right! I love how you’ve included all the variation ideas! DELISH!! Thank you, Annie! I do love simple tasty recipes. Love all the variations, I think I may be making that Smoked Salmon pinwheel soon! Looks so good! Excellent choice, Stacey! It is delicious!! Hope you had a Happy New Year. I love this simple, delicious approach to feeding a crowd, but what really sets this apart is your presentation. The trays look so beautiful, I would love to hop on over and join your party anytime! Thank you. I would welcome you with open arms, Monica! Happy New Year!! How wonderful are these pinwheels! Looks a great appetizer for parties! Thank you, Prasanna! They did go fast. Happy New Year. Oh I love these appetizers. At a party, I am not the most social person and can usually be found standing next to the food. Something like this or the queso. Hi, Ben! Well, I guess you’d have to talk to me because I’d be right next to you at the appetizer table. Hope you have a Happy New Year!! Hello, Helene! Yes, we are lucky to get the wild game. It is delicious and everyone enjoyed the appetizers. Hope you have a Happy New Year. 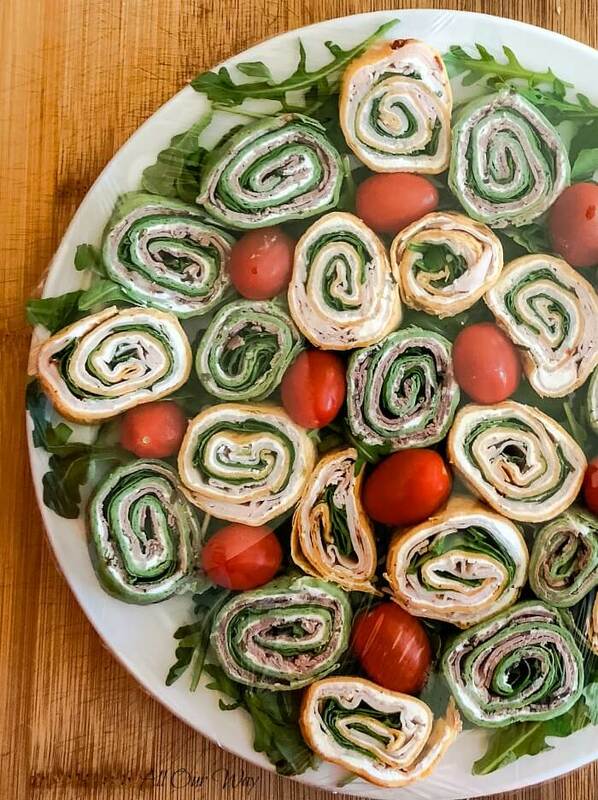 These pinwheel sandwiches look delicious! Just the thing for easy snacks at our upcoming NYE party… thank you for the insipration! You’re Welcome, Meredith!! Happy New Year and may it be filled with joy and prosperity! I was looking over this delicious appetizer recipe and noticed you used Zick’s for the meat – that is made just in the town next to me! We stop in and get ropes of salami almost every Saturday during the Winter. Can’t wait to try this recipe out with some next time. It’s a small world isn’t it, Erin! My gosh that venison jalapeño summer sausage was delicious. We had some of the salami too and it was excellent. Happy New Year!! What a great appetizer for a crowd. I like that you can change the meats and cheeses to make different combinations. Hi, Sharon! The only one I missed this year was the smoked salmon. It is delicious too! Hope you give it a try. Happy New Year. Hi Marissa, Happened to come across your site through Nagi, like you I’m an avid follower of Nagi here in Australia and who has some of the most wonderful recipes. Nagi being here in Australia I know I can get all the ingredients she has in her recipes which sometimes can be difficult with overseas recipe sites. As previously mentioned about some of the ingredients in your “Pinwheeels” such as the various meats, we can’t get them here, but then you guys can’t get “Huon Salmon” like in Nagi’s “Smoked Salmon Dip” (SO YUMMY), so we’re on a par with each other. One can only try various ingredients to their availability and I’m definitely going to try out your “Pinwheels”. I must admit that I’m a “recipe addict” and love cooking that is preparing food any way I can get it, at least trying my best at it. bellissima idea per un antipasto molto sfizioso, Buon Anno cara Marisa, un grande abbraccio ! Grazie, Chiara! Felice Anno Nuovo! Baci e un abbraccio forte. Looks like areal crowd pleaser! It is, Paige. Happy New Year! Irresistible is right! These are wonderful and I’m also loving the sound of the smoked salmon and arugula that you mentioned in the post! Yummy! I am so impressed you were able to slice the sausage so thinly–I bet that was a perfect addition of flavor to these pinwheels. I love appetizers like this that are easy, hand-held and adored by the masses. I can’t take the credit for being the slicer in the family, Kriste. My Honey when he was in high school (many years ago) worked in the butcher dept. of the A & P. You should see him with a chicken! 😲 Hope you have a Happy New Year. Thank you, Kushi! Have a Happy New Year. Really easy to make and with such a great result! Tasty and so pretty to wow the guests! Grazie, Nicoletta. Sei molto gentile. Felice Anno Nuovo! Love the look of pinwheels. They sound tasty. 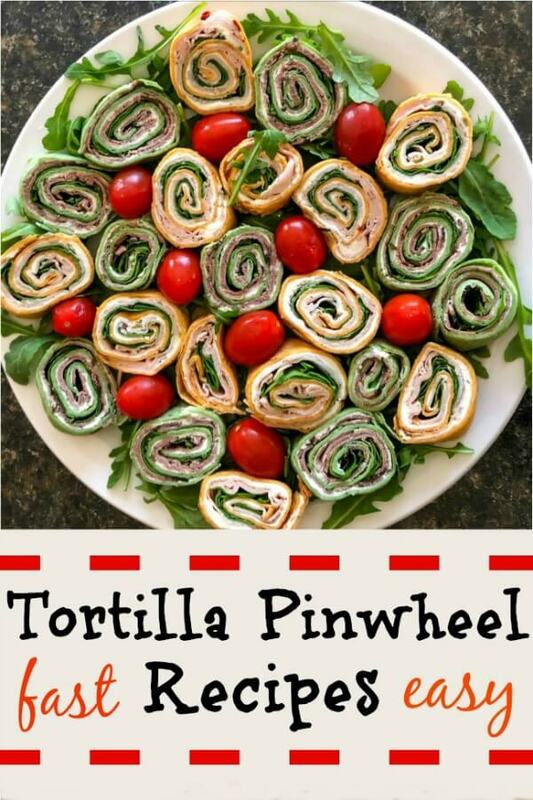 oh this Tortilla Pinwheel looks so delicious… wish I had some right now! Hello, Monica! Wish I could send you some. Happy New Year! I bet this appetizer is a big hit at a party. Looks yummy. Hi, Jovina! It was a big hit — it always is. Our grandsons can grab a few bites and get back to what they were doing. :-). Hope you have a Happy New Year — please make sure the Florida temp is up there. We’ll be heading your way. Love the recipe, but obtaining the ingredients, and I prepare international dishes all the time over Canadian dishes, including Canadian dishes using moose, deer, caribou, etc. . BUT: Jalapeno sliced turkey, venison sausages?? One would never be able to purchase either of those in Canada nor in the US?? Cheers! Hi, Frank!! I don’t know if you’ve read back on our history but Jason, our son is the hunter, he has the venison processed and made into all sorts of delicious cuts. The Jalapeño summer sausage was one of them. In fact, I will include that photo. I realize you can’t purchase the delicious meat in a grocery store. But the chipotle turkey and beef you can. The venison made a fantastic appetizer. The venison mention was for the hunters out there. Happy New Year. Wait until you see the antelope recipe!! WOW, that was good! Loving those pretty little swirls!